World no.1 Rafael Nadal booked himself a berth in the French Open semi-finals after beating Robin Soderling in straight sets on Wednesday. Nadal won the match 6-4, 6-1, 7-6 giving little away to his one time arch nemesis. He will take on Andy Murray in the last four on Friday and will be odds on favourite to march into Sunday's final. In his post match Press Conference, Nadal talks about his performance as well as his prospects in the next round. Q. You said you were perhaps not playing well enough to win the title after the last match. Do you think perhaps your mind has been a little changed today? RAFAEL NADAL: I said two days ago today I am not playing enough good to win Roland Garros. We will see in two days. That's what I said.And today I played better. Much better, in my opinion. Q. Obviously you're playing Andy in the next round; you know him very well. Can you just talk about your friendship with him and how you've seen his game so far this year? RAFAEL NADAL: I think he had a fantastic start of the season during Australia. I thought he had one month without playing his best, but after that he came back and very well playing a very good tournament in Monte-Carlo; after, playing, in my opinion, a good tournament in Madrid. But he lost against a player that -- Bellucci was playing unbelievable there, so was tough match for him. And after, in Rome I think he played fantastic match in semifinals against Djokovic. Was the closer player to beat him this year. So he's doing great. Right now he is in semifinals having tough match against Troicki the other day saving important moments. So he's coming with confidence, and will be a very difficult match for me in semifinals. Q. Coming back to the match, how tough was it to finish the match in the third set? 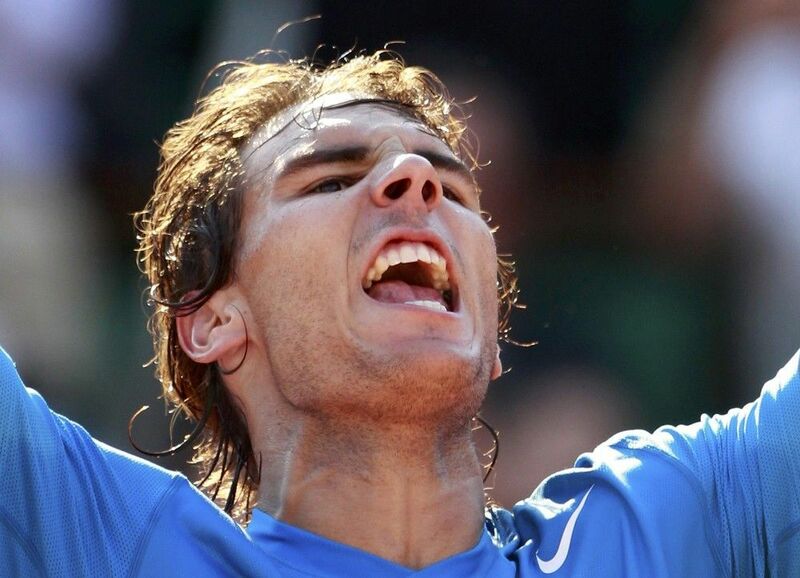 RAFAEL NADAL: Well, this-- you cannot expect to be in semifinals of Roland Garros winning 6-1, 6-1, 6-1. That's true, no? I was winning very comfortable, I think, playing a good level, 6-4, 6-1, 2-0. I think, in my opinion, I had few more mistakes next in that game. Probably I played a little bit more nervous. But he played well. I lost the game, but the game must be deuce, because the umpire had a mistake with my serve, in my opinion. Because when you do a serve to the line, the opponent cannot return the ball. In my opinion, the line said out later than Soderling touched the ball. So that game, I came back in that game, and that game must be deuce. And with the moment of the match, how that match came, was big chance on me to put the 3-0 in the score and probably finish the match early.But anyway, for me was very positive to play a tiebreak, to win a tiebreak in a tough moment like today, losing the first point with fantastic backhand down the line of Robin. I think I did a lot of things very good today, so...And in the same time, was positive to have a close end of match. Because you have these feelings, you feel the pressure, and that help me for the next match, in my opinion. Q. I know it depends also on the opponents, but two days ago you said you couldn't win the tournament. Today, the way you played today, you can win the tournament? RAFAEL NADAL: I don't know. I can be in semifinals. I am in semifinals. So for me is very good result in semifinals. Six semifinals here in Roland Garros. Easy to say; very difficult to do.Seriously, for me is fantastic news, fantastic result, especially how the tournament came without play my best during all the tournament.Today I played well. Quarterfinals another time playing I think a very good match against a very difficult opponent. I don't know if I can win the tournament.Today I was ready to beat the No. 5 of the world and two-times finalist in this tournament. We will see what's going on next round. Q. I'm assuming that you know that Andy hurt his ankle quite badly on Saturday and has been playing with lots of treatment and painkillers. How difficult is it to play a guy you know pretty well when you know he's injured? RAFAEL NADAL: Well, playing five-sets matches and today playing a tough match and keep winning, probably he have pain, but the pain is not limiting. (Translation.) (Laughter. )&nbsp;I wanted to say like this but, I don't know if was right. So that's what I feel, no? I think probably that the pain is onthe ankle, just turned ankle.p> <p>I had sometimes in the past, and is something that you feel pain, but in my opinion, is not limiting you when you are playing, because just resist a little bit the pain. It's not something that you gonna go down or you feel that the foot is not have enough power to keep running, no?p> <p>So in my opinion, that's not gonna affect him and his confident to be in the semifinal. He's playing well. He's big player. Q. What do you think about Djokovic/Federer semifinal? RAFAEL NADAL: Well, the best player of the world today against the best player of the history, so difficult to say more things. Gonna be, in my opinion, fantastic match. Will be for sure a really tough match, in my opinion.We will see what's going on. I think both of them have chances to be in the final. Djokovic is playing fantastic; Roger did very well during all this tournament. Roger have enough potential to beat everybody, and you know how good can be Roger in the final rounds of a Grand Slam. Q. Was there anything you did or any adjustment you made that got you to the point where you played to this great level today? Was it an adjustment you made in practice? Was it really not until you got on court that you felt, Okay, I've reached this new level and I feel better? RAFAEL NADAL: It was nothing secret, nothing magic. Just I said every day, and I don't want to change what I said every day. Just I try my best in every moment. I try my best in every practice, in every match, trying to play with positive attitude all the time, trying to find solutions all the time.Today I found a lot of solutions in my opinion. So I am happy about how I arrived to the semifinals, especially after the big victory of today I think against a difficult opponent.&nbsp;So that's what I did. Is no secrets in this sport. Only try your best every day and try to enjoy it, suffering sometimes. Q. Matches between you and Andy seem to produce something special every time, almost like you enjoy playing against each other. He certainly says he always enjoys playing against you. Is it the same for you? RAFAEL NADAL: Well, I prefer playing against an easier opponent, that's for sure. (Smiling. )But play against Andy always is a big challenge, because you know how good is he, and his talent is difficult to compare with a lot of players, in my opinion.Yeah, he has all the shots. He can defend very well; he can attack very well; he runs fantastic. The only thing that you can beat him is playing at very, very high level. It not gonna be impossible. That's what I gonna try. Q. Incredible match. Once again, you're going to spend your birthday here. Well, we'll see on Friday. But today you were able to control the serve of Soderling and you returned very efficiently. RAFAEL NADAL: Well, I think I was able to move very well, even better today than in any other matches in this tournament. I had the feeling I was really covering the court much better and I was able to run a lot better than the former matches.Sometimes he was putting me out of the court, and I was able to run back. I think he was a very tough opponent, and I was able to put him out of the court because this is how I like to play. What I like is play a bit slower with higher balls, and I was able to play that game. I needed to hit the ball very many times before I was able to win the point. Q. I think what counts beyond the score is in fact the way you were able to win that match. RAFAEL NADAL: Well, what satisfied me most without any possible doubt was the improvement in my game. I'm happy to be in the semifinal again of the French Open.But now what I believe is I was able to overcome a very tough situation. I reached the semifinal without playing my best tournament. Well, today was my best match, I believe. My highest level in the tournament. I think I improved every day. I was able to today find solutions that I didn't think I was able to find. So I'm very happy that I was able to find those solutions today, and I was happy because I was very focused during the whole match.p> <p>I think during the whole match I didn't have any letdown, so I was able to maintain my game at the level I wanted. He's a tough opponent, and I was able to play very good points to be up in the score.He gave me nothing. I had to fight all along the match. Q. The other day you were saying that every time you were meeting a tougher opponent you were adding something to your game and you were doing something better. Can you tell us how you can practice that? And also, two break points, one in the tiebreaker, you were able to serve extraordinarily well. How can you save those serves for these important moments? RAFAEL NADAL: Well, I never try to save something. Never. I always try to do my best. And also, how can I raise my game when I need it? Well, you know, your opponent helps you to improve your level.Today I was able to improve my game enough to be able to win. Sometimes it's not enough. I don't know if you can practice on that or not. But I believe the best players always are able to do that, because otherwise they wouldn't be the best players. During the past years, I was among the top players in the world and I was able to do that. I believe one day I won't be able to do it anymore, but today I did it. I'm going to keep going and remain very cool, because what I did is now reach a semifinal in a very important tournament for me and for everybody else, too. I was able to win many points, and I have many points to defend. But what is important is not the points I'm making but just playing well and just being in a good position in the ranking.Now, of course, for the serve I always try to serve the way I believe is the best for me to win the following point, and I always try to hit where he doesn't expect. I don't want to give him an easy ball.Sometimes I try to gain some time. I try to serve in a way that gives me more time to return. In the beginning he-- what I tried to do is serve on his backhand. I tried to serve in the important moments on his backhand and put him out of the court.Because if you always serve in the same place he always goes to the same place. Sometimes I tried to surprise him. That's always what we do. Sometimes if you do the contrary that you have been doing before, you surprise him. This is what happened in those moments.So I used that in the tiebreaker, and it was very useful. It was also very useful in other important moments. Q. I would like to know, can we say that this was the most complete match you have played in the season on clay, given the opponent you had? RAFAEL NADAL: No, not of the whole season. I played two finals in a row. You should not forget that, because you can't reach finals in a row like this being unsatisfied with your game all the time. I think those matches were good. I don't believe this is the best match of my season. I played very good matches in Barcelona against Ferrer or the first round in Madrid, against Llodra in the quarterfinal. So I had many matches that were pretty good in my view. And also the final in Rome was very good for me. I played a very positive match there. I think that I was able to play my level on clay. Sometimes when conditions are more complicated I was able to play well all the same, and this is very positive. Also, I was able to recuperate after tough matches, and this is good. Q. Can you answer in Spanish something you answered already in English? Can you tell us what do you feel that now you are playing Murray? And what do you think about the other match between Djokovic and Federer? RAFAEL NADAL: Well, I believe that Murray was able to play five-setters lately, and I don't believe the fact that he has some pain in the ankle will limit his performance at all.It happened to me also to have some pain, and the issue is how you resist the pain. For me, logically I believe that as the tournament goes on, you improve every day, and you don't think about what you feel.I think on Friday he will have no pain anymore. He'll be 100%. He's a very special player. He has a lot of talent. He does many things very good. The only way of beating him is to play my best level, very aggressive. I have to oblige him to play many good points to win me. I will enjoy my match. I will play very focused, and I hope I will play as well as I did today. He's one of the best players. Among Djokovic and Federer, I believe it's the best player of the time against the best player of history. So there again, it's going to be a beautiful match.I would watch it if I was a spectator. Q. This year you seem more serious. You don't laugh as much. You used to make many jokes before. You seem a bit sad. Can you tell us why? Is there a reason? Are you just tired of the press or the questions we're asking? Maybe it's just an impression of mine. Q. The level of the tournament is very high. You had difficulties. Of course people must realize it's very tough what you're doing and the tournament is difficult. RAFAEL NADAL: Well, people who are just spectators who are not in this world of course don't always know what is our daily life and what are the difficulties we have every day. Because we have to keep winning every day, and to reach where I am, again, it takes a lot of work.But it's not a problem for me. Everybody knows I think that in top competition anything can happen. In end, there's only one winner. It's just mathematics. The other hundred players lose. Every tournament is the same.I believe it's a very demanding sport, mentally and physically.